From Spokane Valley: Start on onto I-90 W. Merge onto US-2 W via Exit 277 for 4.4 miles. Turn right on Hayford Rd for 1 mile. Northern Quest Resort & Casino is on the left. 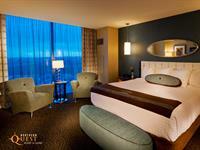 Northern Quest Resort & Casino is the Inland Northwest's premier destination resort.